81,000+ workers have missed paycheques, been underpaid, denied health benefits, and even had child support payments disappear – all thanks to the Government of Canada’s political and technological fumbling as it launched an untried, unmanageable pay system called PHOENIX. Unlike its mythical namesake, this PHOENIX immediately crashed and burned in the flames that spawned it… and the authors and administrators of the disaster, at Public Works and Government Services, insist that it works. The following case, is one of a local retired Public Servant waiting months for a pension, and a final employment payout because (among other reasons), the government didn’t know he retired!! 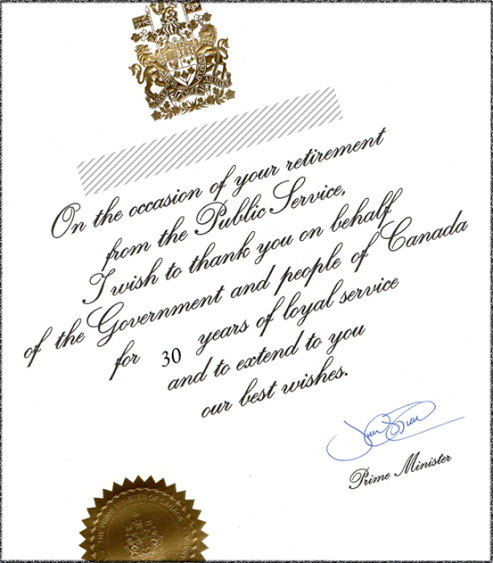 After 30 years of Public Service, the award of a certificate signed by The Prime Minister seemed a flattering gesture, but more than 2 months afterward, I was still waiting for the more gratifying gesture of pay; for my last 2 weeks of work; my vacation pay; and my pension… it was time to pick up the phone. I was surprised when the agent that I reached at the pension centre informed me that there was no record of my retirement – apparently a written resignation, congratulations from the Prime Minister, and not showing up at my desk for 2 months had not caught anyone’s attention. – I informed the pension centre agent that I would be visiting the Wellington Street office of Prime Minister Trudeau to return the retirement certificate he signed, and ask him to explain his error. – I also suggested that the agent and the office manager would then likely have the opportunity to explain things to a Deputy Minister shortly afterwards. – Within that 72 hours my first pension payment was sent for deposit to my bank account. Again, but not surprisingly, there was no record of my departure. 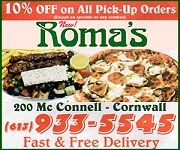 – I was told that to get paid, the onus was on me to talk to my last manager. – Thanks to modernization I was now submitting paper forms to my last manager who then “snail mailed” them away. – After 4 months the case of my near $15,000 wasn’t settled. – Repeated calls to the pay centre require up to 3 hours (50+ tries) to get through and are regularly dropped to a “busy signal” on the way. – Agents do not have adequate information in one place (Name, PRI, Case Number, case tracking, actions taken… these are apparently not cross referenced or accessible in a useful way. Editor’s note: We have protected to identity of this letter writer to protect them from any possible retaliation. Not surprising at all. Before and after I retired I was always calling my pay clerk and the pension centre to be sure everything was okay. You can’t assume that everything is going as it should. A system apparently inherited by the Liberals from the former government. Checked and rechecked using a logic based Liberal verification protocol before being approved and rolled out. Hope these were not the best and brightest Liberal minds or else we will never emerge from the darkness. Any engineer — mechanical, structural, electrical, or computer — knows that before signing off on a product, it needs testing under every possible condition and scenario, and tested to the point of failure. And certainly in the case of computer hardware and software, there must be a parallel system, a backup, or a functional and tested plan “B” to seamlessly fall back on . There are no problems with the system’s hardware or software. The problem is with the lack of training and expertise of the operators. The Harper gang got rid of the competent people who were handling the job in Ottawa for years, and replaced them low payed unqualified ex-MacDonald’s employees. What could go wrong? The problem is / was Harper wanted an off-the-shelf solution for pay management in the PS and not enough research was done on this. This is what can happen when you go with the lowest bidder on a contract. You get what you pay for. PHOENIX is not COTS (Commercial Off The Shelf) software; really only the hardware is COTS. It’s built with bits of, and meant to be compatible with, Oracle People Soft. So the Liberals are responsible for the roll out and verification but in the end it is Stephen Harper and his brand of Conservatives at fault? Are Liberals therefore incapable of accepting responsibility or simply incapable period. What pray tell is wrong with an employee of MacDonalds? Only one person for each job at MacDonalds. Three for each job in the government at least. Harper and his crew were responsible for selecting the “winning” contractors. As well, the were responsible for starting the roll out. It’s not just a matter of throwing a switch and hoping it works. David, I agree that the Libs should have shut down this asinine program that was put in motion by the Harper regime. But you must admit that the Cons left a lot of messes that needed cleaning up after they got the boot. Furtz each government leaving power no doubt leaves unfinished or rushed business for the forming government to contend with (nothing new there) The Liberals were dumb enough to perhaps fall into a carefully laid plan. My issue is that they need to be much smarter than they look right now. A decline in confidence usually denotes a slide into political oblivion or a hard battle position to defend. Actually David, The Libs are riding higher in the polls now than they were on election day. If an election was held now, they’d win 80% of the seats. Quite the honeymoon! Furtz I never cared for Harpoon Harpo and I dislike Justine even more. There is going to be severe problems coming Justine’s way. Wait until the US election comes up and we may have an influx of disgruntled yankees coming up this way. We better seal our borders. I am following the US B.S. and don’t be surprised to see a civil war and marshal law that is coming soon. Yes Jules, and 100 pound hailstones will be raining down, along with two-headed talking snakes and toads wearing yellow capes. It will all start happening before December. Furtz you are relying on polls? Typically Canadians do this rather than utilize their own cognitive powers. Apathy trumps intelligent thought in Canada. Sadly you may be right. Consider what Canada will look like in 15 years. An additional legal system to administer to a growing and eventual religious majority will no doubt meet most Canadians approval. Not me, count me out. Oil and vinegar. Furtz Liberalism has radically impacted numerous democracies (social and otherwise) in an extremely negative manner. Have you an understanding of the current situation in say Sweden? Great Britain? France? Liberalism whether you choose to agree with the political experts or not is a root cause of many issues facing us and rest of the world today. Liberalism continues to fuel the problem with Islam. Does anyone have an opinion? Seriously Jules? Civil war and martial law?? Please think, or at least do some research, before spewing your untruths. Do a Google search and see what is involved in moving to Canada from the U.S, or other countries. It’s not as easy of deciding to move here. You have to be accepted by CIC, etc. The Americans who want to move here are in for a big surprise. You completely lost be, David. I do have a reasonable grasp of world and domestic affairs but I’m no expert. Are you saying that Liberalism is the cause of all the world’s problems? Seriously? If so, there’s no point in discussing these things. Canada may be the easiest country to immigrate to. But it is not as easy as some think. It is a long process. Any American thinking they can just move here are in for a rude awakening. Hugger the immigrants here in Ottawa who come from Lebanon told me that it takes anywhere from 5 to 7 years to immigrate to Canada. Australia is mighty tough and we had our own experience back in 1981 wanting to go there and my husband went to visit his brother and didn’t like it – way behind our Canada in every way and mighty hard to get there worse than Canada to immigrate. No Furtz if you read what I wrote I did not say that Liberalism was the “cause of all the world’s problems”. However if that is the avenue that you wish to take to avoid engaged intelligent adult conversation, then so be it. An opportunity lost. Meaningless babble will never solve our bigger issues but for some it is more entertaining. To each their own. I’ll take a pass David. Life is too short. And you don’t think 5 to 7 years is long enough to immigrate? To me it shows we put due process in vetting immigrants. Hugger1…due process with some immigrants. Personally I would like to see Canada more consistent with all candidates being considered to join us. I would also like to see no more than 10% landing immediately onto welfare. Oh and welfare should be a maximum 18 month temporary period or a return ticket will be provided. With the huge number of refugees awaiting settlement,the fallout from wanderers and “lost boys” was largely avoided. Simon that was only the very tip of the iceberg of refugees coming into Canada and Trump doesn’t want Muslims nor anybody coming from such countries in the Middle East where they can start up trouble like ISIS, etc. Canada, Australia and Europe will be stuck with all of them. Many have diseases and I read things yesterday that turned my stomach. Just wait and see what is going ot happen. Simon have you ever wondered why a Muslim would want to leave their country of origin? When Islam is diametrically opposed to Western ideology and our liberal social progressive society what is the drawing card. Do any readers know what the word Islam translates into beside possibly Jules? David, have you been hanging out with Newton much? Excuse me Jules….but who the f*** cares what Trump thinks in regard to Canadian immigration?? I sure do care that Trump gets in as president of the US and he is the better candidate for the job whether you agree with him or not. There are things that I differ with him and other things as a general rule I am rooting for the man to get in. The US needs tough leadership and so do we need a tough leader as well and not some selfie adict. We need a real leader to lead and govern. Hugger Trump is right and what happens here in Canada affects the US and vice versa. There are many unprotected borders between Canada and the US and people can go across and not be detected. A governor of Wisconsen wanted to put up a big fence between Canada and the US and I am all for it. You have no idea what goes on Hugger and you would be shocked. Uh uh Jules. I worked for CIC for a number of years. So I know what is going on. I follow the news, etc. I do not have my head buried in the sand, as I’m sure you want to imply. It looks like the government cannot find any solutions and is going to go way beyond the due date to get this resolved. Not many good programmer analysts out there to resolve this problem. Don’t count on Justine when his task is in front of a camera posing for selfies and letting Rome burn. Justine and Winnie the Poo are completely incapable of anything worth while. Get rid of both of them. Don’t blame Justin Trudeau on this one. This mess was started by Stephen Harper and his cronies going with the “winning” lowest bid. The government was warned by several organizations that Phoenix wasn’t ready. But the gov’t once it sets its mind to something can’t be stopped. the old pay system was put out to pasture long before Phoenix was ready. HOLY JUMPING JOSEPH MOTHER MARY! Go on yahoo.ca news and please sit down to read this folks. It is going to cost at least $25 million to fix the Phoenix system and you should read the comments. LOL LOL. ROLF! Gee if I can only use the nice language that many want to use. We taxpayers are on the hook again for this failed nonsense.